I love the scent of roses, the smell is soft and delicate. One of my favorite ingredients in baking is rose water which lends a soft and delicate flavor to your baked goods. These Tender Rose Petal Shortbreads have just that hint of rose flavor baked inside and the crushed rose petal toppings add color, and a bit of floral essence to these pretty and tender cookies. Since these shortbreads are made with rice flour they are gluten-free. Over the years the scent of roses seems to have gone away which is sad, after all roses are supposed to smell like roses; right! In order to have the perfect rose that lasts longer growers have cultivated the scent out of the rose. So I am curious when you get roses do you smell them? I do, and sometimes I get some that have the most subtle scent which is glorious. The first time I was introduced to rose water was at a church function with my grandma. I remember walking into the decorated church hall with rose bouquets on the tables and the smell was mesmerizing to me. But the best part was the dessert. When they brought out the dessert I knew this was the most extravagant thing I had ever eaten. In a stemmed glass dish was a strawberry rose water mousse and on top sat a single red rose petal. You must understand, I wasn’t in some big city being served such a delectable treat, I was in Losantville, Indiana, population 500, being served by church ladies. Needless to say, I was impressed, and over 50 years later the memory is still so fresh in my mind. Bless you, grandma. Not familiar with rose water? It combines well with fruits, especially strawberries when it is served by church ladies, and it does wonders in a sorbet. The flavor is mild and adds just a hint of rose. Try it in your teas and lemonade and, rose water is a delightful addition to milk-based desserts. I know you are thinking why buy a whole bottle of rose water for one recipe, well I’m here to tell you there are lots of uses for rose water, the list can be endless. You can buy rose water here. I’ll share some uses later. Let’s talk about the cookie. When I made these shortbread’s I happened to have little rosebuds that I bought from a tea shop in San Francisco. We brew the rosebuds for tea, and occasionally I use these for recipes. If you would like to buy these rosebuds from the San Francisco tea shop tea shop this is your nonaffiliate link: https://vitaltealeaf.net/index.php/flower-herbal/siberian-rose-4-oz.html. You can also get just culinary rose petals here. All other kinds of topping can be used for these dainty little cookies from coarse sugar, colored icing, white chocolate or maybe just put a pretty stamp on top. When you make the cookies, you get to decide what goes on top. The beauty of making shortbread cookies is they contain a few ingredients. You just mix your butter, sugar, flour a, d salt to make a soft dough, add in your other favorite mix-ins and you are ready to go. Ohh, now the fun starts. I grind the rose petals in my coffee grinder and then sprinkle the petals on top of the dough. You can also use your rolling pin or your hands to crush the rose petals. To get the petals to stick to the dough I gently used the rolling pin and rolled them slightly into the dough. You can roll and cut the dough any way you want but I like to make a rectangle to cut the shortbread into thick strips and there is no wastage or rerolling of the dough. Gotta love that, right? I cut the dough down the center to make 2 1/2 inch x 1inch long slices. This way they bake nice and sturdy. Tender shortbreads with the scent of rose water with a rose petal topping. Mix the rice flour, powdered sugar, and cardamom together in a bowl. Beat in the egg and rose water until blended. Remove dough from bowl and place on wax paper or plastic wrap; wrap tight and chill for at least 2 hours. Remove dough from wrap and roll on a floured board to the shape you choose. You can also use a cookie scoop and roll into balls then flatten. If using the dried rose petals - remove individual petals and crush using your hands or do a quick grind in a coffee grinder. Sprinkle the rose petals over your rolled dough and then press into the dough so the petals stick better. Cut dough into your desired shapes. Bake on a parchment-lined baking sheet for 20 - 25 minutes or until bottoms are golden. These Rose Petal Shortbread cookies are melt in your mouth tender and look so pretty with the rose petals and have just a hint of rose flavoring. Of course, I had to make a pot of tea for my cookies, but pairing a rose’ wine would be a divine treat too! Rose Petal Shortbreads and a cup of tea – the end of a baking day! If you remember reading above I talked about other uses for rosewater. Besides these wonderful cookies, what else rose water be used for? Use Rosewater on your face and in your hair. It’s a great toner and hair rinse. Use Rosewater as a perfume. Scent your sheets with Rosewater before you go to bed and you will have a peaceful sleep. Just put rosewater in a spray bottle and mist your sheets. Use with cakes, cookies, custards, fruits and all kinds of desserts. 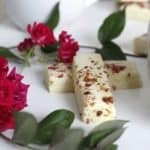 I hope you try this easy and delicious Rose Petal Shortbread recipe to taste the essence of rose water. Are you already using rosewater? Leave me a comment and tell me your uses. Blessings to you and all the church ladies out there that bake and cook so many delicious desserts. I have been thinking of making some sort of rose treat recently and these shortbreads sound awesome. I also love that they are GF for my gluten free friends! Noooooo! Growers are cultivating the rose smell out of the rose?! THAT’S THE BEST PART! But I love how you’ve crystallized the essence of the rose in your rose petal shortbread recipe. I’ve never baked with rose water before—let alone rose petals!—so I can’t wait to give this a try! And I’m definitely trying out the other great uses you suggest for rose water! OMG I am swooning over this! I love shortbread, but never even thought to use rice flour. I am so intrigued. Love the use of the cardamon too. I def have to try this – I have a bunch of rice flour in my pantry. I’ve used rose water to make ice cream before but never petals. These cookies are so pretty! I’ve always been reluctant to use rose in recipes because I’m afraid it would get too strong and the food will taste like potpourri. This looks great though, and super simple that I’ll just have to get over my fear and try it! I have found when I use rose petals or rose water for flavoring it is always a mild flavor. Obviously, you can go way overboard with the flavor if you start adding in tablespoons of flavor. Give it a try, I absolutely love rose flavoring. These look super yummy! I love shortbread and I bet the rose flavor is just perfect! Hope you try these delicious cookies. I am searching for more recipes to use both rosewater and the petals. I just love the flavors. I finally ordered some rose petals so I could make something similar but haven’t gotten round to it yet. These looks so beautiful! and with rice flour so they’re glueten free. I know plenty who would enjoy these! I love the flavor of rose water and rose petals. These shortbread look so delicious and love how white they are. The rice flour keeps these cookies white. I haven’t tried any recipes with rose water, but these cookies look delicious. Great idea for those days when I’m in the mood of experimenting with new ingredients. Thanks for sharing! I love experimenting too. You never know what great flavors are out there to bake with. What an idea to add rose petals in the shortbread. I wonder how it tastes as the rose water together with petals is quite fragrant. These shortbreads have a mild rose flavor, it’s not overwhelming but enough to know there is a rose flavor. These look amazing! However, it’s surprisingly difficult to find rose petals that ship to Norway at an acceptable cost. I found some, mixed with other flowers, maybe they could be used. I do have a source for rose petal on my shop page. Shipping is always an issue. Ohh this sounds amazing! Love it! I have never used rosewater but it looks like such a fun spring add in. Perfect for a girl’s get together! What a beautiful, elegant recipe! Yes, when I get roses, I automatically smell them! They are lovely. I can’t wait to make these cookies and share them with my friends! They would make a perfect gift. I wish roses smelled more than they do, but occasionally I can find one that is perfectly scented. What beautiful shortbread. These would be perfect for a tea party. Rose petals are so pretty on desserts, this sounds so delicious and perfect for afternoon tea! I agree adding rose petals just makes desserts look so pretty. This shortbread would be perfect for a tea party! I bet they small amazing while they’re baking! I did make these for a tea party and everyone love them. One question, the recipe says 1.5 cups powdered sugar and says to mix with flour,but next step says mix sugar with butter? Is there additional sugar in recipe? Oh, my what a goof. There is only powdered sugar in the recipe and it is mixed with the rice flour. So appreciate you letting me know.